Bought this 3 weeks ago for £170. Has been hovering around £155 since then with a dip to £150 for a day. I have the older 1600, totally worth the price and great for gaming. Heat! this will be better again and is £20 cheaper! heat! Ryzen 7 1700 at £169.00 is better than this? For gaming, generally this (2600 is better) since most games don't utilise many cores. newer, fast clock speed. but for workstation (multitasking), 1700 is probably better due to 2 extra cores. depends on what your using it for, games get this, content creation get the 1700. If you got it 3 weeks ago at £170 at amazon, ask the nice ladies & gentleman of live chat, to refund you the difference! If you got it 3 weeks ago at £170 at amazon, ask the nice ladies & …If you got it 3 weeks ago at £170 at amazon, ask the nice ladies & gentleman of live chat, to refund you the difference! My bad, surely a £100 CPU be good enough for gaming? As its a prime exclusive it should, had some ram 2 weeks ago, went on deal, £19 per stick refunded to payment method, after a polite chat, worth a try, you never know! I just build a system with B450/R5 2400G/16GB RAM for my son to run Steam. He is really happy with it. But I doubt it's 'good enough' for professional gamers. Any recommendations for a mATX board, does not need SLI but would like 4 memory slots. Is it worth the extra for the B450 chipset rather than the B350 ? As its a prime exclusive it should, had some ram 2 weeks ago, went on …As its a prime exclusive it should, had some ram 2 weeks ago, went on deal, £19 per stick refunded to payment method, after a polite chat, worth a try, you never know! I'm still waiting until Memory prices start to go back to normal. Bobbystein's reply was about you suggesting a build with the OP's item (a CPU) and a £100 CPU. Gaming or not you only need one CPU. Whether or not this CPU (or a cheaper one) is better for you depends entirely on what you're planning to play. The 2600 (as posted by the OP) would be enough for the vast majority of PC gamers assuming you aren't after absolute top tier tier graphics settings. A CPU in the £100 region might be alright for now but if you want to play modern AAA games it may not be very futureproof. "good enough"? I just build a system with B450/R5 2400G/16GB RAM …"good enough"? I just build a system with B450/R5 2400G/16GB RAM for my son to run Steam.He is really happy with it. But I doubt it's 'good enough' for professional gamers. 16GB is such overkill for the integrated graphics isn't it? If you plan to get him a GPU in a year or twos time then I understand. Exact same experience here. Obviously make up a reason so you don't have to pay for the return shipping tho!!!! The ryzen+ (2000) series are better for all gaming and significantly better in high Frame rate games like csgo, overwatch, TF2 ect due to lower cache latency. For lots of productivity workloads you might gain something from 2 extra cores but not all. Also 2nd gen ryzen with a b450 board will have far better memory support. No offense my man, but if you're asking questions like these you need to do a lot more research before you buy anything. No offense my man, but if you're asking questions like these you need to …No offense my man, but if you're asking questions like these you need to do a lot more research before you buy anything. Fair enough. Depends on what you mean by casual really, if you're playing CPU heavy games like the newer Assassin's Creeds you might be well served by a more expensive CPU. I agree with Boris, there a lot of CPU intensive games out there, both the CPU and GPU are important in gaming. I have a AMD FX6300 and it really bottlenecks my GTX 1060 from achieving what it should. 16GB is such overkill for the integrated graphics isn't it?If you plan to …16GB is such overkill for the integrated graphics isn't it?If you plan to get him a GPU in a year or twos time then I understand. Isn't better to run in dual mode? If not then I might nick 8GB off him for my own build. Any recommendations for a mATX board, does not need SLI but would like 4 …Any recommendations for a mATX board, does not need SLI but would like 4 memory slots. 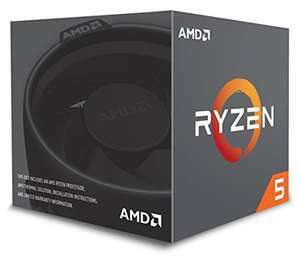 Is it worth the extra for the B450 chipset rather than the B350 ? I went with a cheapy ASRock B450 as I didn't want to mess around with BIOS update ... as R5 2400G may need the update. There was a YouTube video I watched which compared the B350 with B450. I can't remember the channel. Yes, true. But I had 2x8GB spare ...Isn't better to run in dual mode? If …Yes, true. But I had 2x8GB spare ...Isn't better to run in dual mode? If not then I might nick 8GB off him for my own build. Yeah 2x4gb in dual channel mode is supposed to be better than 1x8gb in single channel, but there is really negligible gain most of the time. If you had it to spare then fair deuce. Make sure the RAM stick matches what you have in your system if you're going to nick it, otherwise might not work as well. Ryzen thrives in memory speed. Dual channel can only help. Also integrated GPU robs the system of memory. So while you have 16GB. If the GPU takes say 4GB. With one stick his system will be left with 4GB. Bought a 2600x a month ago. Had to return it as PC would not POST. I'm staying with Intel from now as never had any problems with their CPUs. Ryzen thrives in memory speed. Dual channel can only help. Also integrated …Ryzen thrives in memory speed. Dual channel can only help. Also integrated GPU robs the system of memory. So while you have 16GB. If the GPU takes say 4GB. With one stick his system will be left with 4GB. Would make sense to allocate the GPU for memory then? Bought a 2600x a month ago. Had to return it as PC would not POST. I'm …Bought a 2600x a month ago. Had to return it as PC would not POST. I'm staying with Intel from now as never had any problems with their CPUs. I agree with Boris, there a lot of CPU intensive games out there, both the …I agree with Boris, there a lot of CPU intensive games out there, both the CPU and GPU are important in gaming. I have a AMD FX6300 and it really bottlenecks my GTX 1060 from achieving what it should. My son has an fx6350 and a 1070. Wooah, before I get the “bottleneck what you doing” comments the 1070 was a straight swap for an RX 470 when RX prices first went mad. The FX6350 plays nice with pretty much anything. Yes, definitely bottlenecks but way better frames than the RX470. He plays ultra wide so essebtially 1440p. Very little struggles under 60fps on very high settings. The odd setting like shadows may be down to high or AA may not be at the highest, but who could rally tell? My son has an fx6350 and a 1070. Wooah, before I get the “bottleneck what y …My son has an fx6350 and a 1070. Wooah, before I get the “bottleneck what you doing” comments the 1070 was a straight swap for an RX 470 when RX prices first went mad. The FX6350 plays nice with pretty much anything. Yes, definitely bottlenecks but way better frames than the RX470. He plays ultra wide so essebtially 1440p. Very little struggles under 60fps on very high settings. The odd setting like shadows may be down to high or AA may not be at the highest, but who could rally tell? If you swapped an RX470 for a GTX1070 you did really well, the other person might still be crying. So when you put the Intel CPU in the motherboard did it post ok? Oh wait it doesn’t fit so you have no idea of the cause. More likely, you bent a pin or something. The board was an X470 which is designed to work with Ryzen Gen 2 out of the box. If you swapped an RX470 for a GTX1070 you did really well, the other …If you swapped an RX470 for a GTX1070 you did really well, the other person might still be crying. The other person was a miner I expect. Sold RX470 for £310 bought 1070 for just under £300 from Amazon warehouse. In fact I did that for 2 cards (both mine and my sons’s). Although second time round I had to add £30 to the 1070.